In celebration of the centenary of the Campaign for Women’s Suffrage, Collective Exchange will be holding an exhibition at The Bruce Castle Museum later on in the year, focusing on local stories of the Suffrage movement in the Haringey area. Do you have a local story or knowledge on the subject? Was someone in your family involved in moving women’s rights forward? You can also contact us via email if you have any images you would like to share. The exhibition will occur in conjunction with a series of workshops in which we will continue to explore gender equality in 2018. By investigating language, specifically gender biased language and female depiction in the media, we will challenge our own unconscious biases and explore where women’s place in society is today. Our two trial workshops held in October explored unconscious biased language which many of us use without even realising. It produced some very thought-provoking conversations. 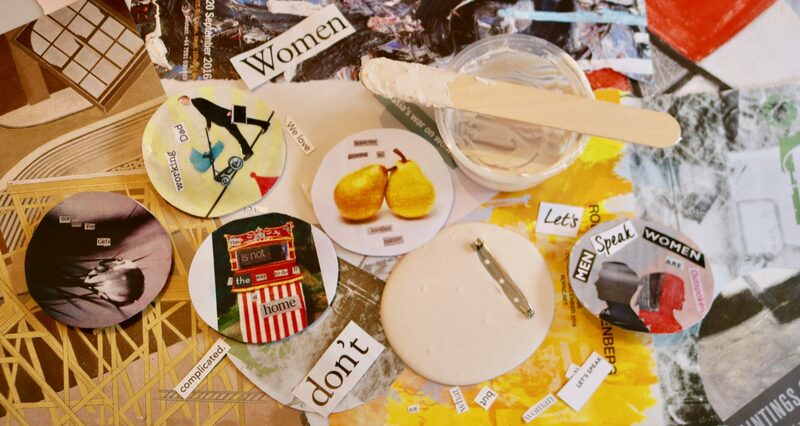 Using collage, we invited participants to create their own statement badges whilst engaging in dialogue during the making process. The topic was approached from many different angles, not only from a female but also from a male perspective. The pieces produced would definitely start some very interesting discussions…! We will publish follow-ups on these inspiring, thought-provoking creations and are currently engaged in further research on this subject and are looking to hold more workshops in the new year…keep an eye on our blog for further updates and information. February 2018 marks the centenary of the Campaign for Women’s Suffrage which was partly achieved by the Representation of the People Act 1918 – allowing women over the age of 30 the right to vote. During the coming months, Collective Exchange will not only be reflecting on those turbulent times which surrounded the Suffrage Movement but will also be looking at how attitudes towards gender inequality have altered over the years, where they currently stand today and how much change is still needed for the future. Through a series of workshops we will start by investigating language, specifically gender biased language, as a way of beginning an exploration of women’s place in society. Two making sessions will be held in September with dates, venue and content details to follow.